Imagine you’re a Virginia Historical Society curator in 1994 hanging out with your curator buddies. The phone rings. 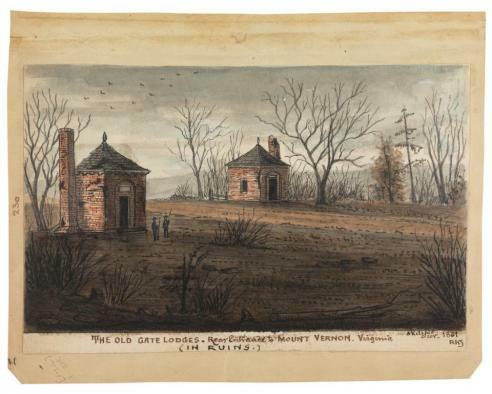 An art dealer has a bunch of original Civil War drawings and maps. “Sure, bring ’em by,” you say, not expecting much. The art dealer places four tattered volumes of intricate, beautiful drawings and paintings on your desk. Your heart skips. You don’t let on to the dealer. You make some calls, beg some people and buy the volumes. But there’s more! A little (a lot) of digging at the National Archives and a conversation with a 99-year-old local and family historian leads you to a storage facility in Arizona belonging to the great-grandson of Private Robert Knox Sneden the artist of the maps and drawings. Inside the storage unit lies 5000 handwritten pages and hundreds more drawings documenting Private Sneden’s incredible, harrowing and ultimately inspiring journey through the Civil War! I bought this book years ago because I liked the drawings. I didn’t read the preface or the book blurb when I finally read it this week. For the first 50 pages I read it mainly because I still liked the pictures. Sneden got lucky. 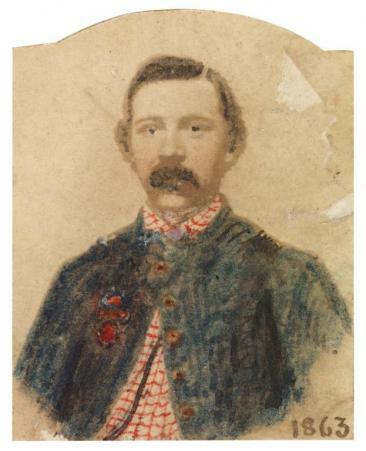 General Samuel Heintzelman noticed his maps and drawings and scooped him up. As a lowly private Sneden was given enormous freedom in his new position. 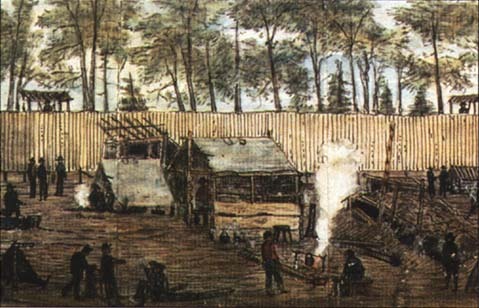 As the army sat idle under McClellan he wrote about the everyday life of an army at rest. Eventually he wrote about an army at war. Just when I got lulled into the boring life of a waiting soldier Sneden’s luck changed. The private didn’t write like a prissy 19th century guy. Horrifying, funny and grim events are detailed in a matter-of-fact way that’s a little unsettling. At first it’s just soldiers robbing graves in churchyards, a few injuries and deaths, but then all hell breaks loose on the pages: mules and horses left for dead after giving out in thick Virginia mud, others slaughtered wholesale so the enemy won’t get them during a retreat; locomotives filled with millions of dollars worth of supplies and ammo set fire to as they screech driver-less over a bridge and into the water; blood streaming out the bottom of ambulance wagons and walking wounded dragging themselves with terrified eyes away from the Rebel army nipping at their heels. One dark evening Sneden and a few other engineer types are stay behinds at a temporary headquarters. Sneden spots shadowy figures on horseback in the woods. He fears them–I feared them as I read. He warns his roommates but they laugh. The following morning they’re captured. 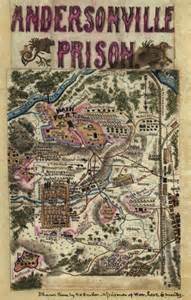 I kept waiting for Sneden to escape even though by now I’d looked ahead and knew the poor private I’d grown to love would end up at the notorious Andersonville Prison Camp. Throughout his harrowing year in prison Sneden keeps his wits as 30,000 men are crammed into a tiny prison yard on swampy, treeless land in Georgia. Millions of maggots rise from the swamp, thousands of men lie sick and dying. “Sick and dying” is a clinical way of putting the immensity of the suffering that Sneden writes about in such detail. He’s a good man and that’s what really gets me as I read this. He shares, never descends into the depravity of the desperate others who gather around a sick man waiting to steal his tin cup when he dies. All the while he sews his shorthand notes into his shirt, trousers and hat, sending home his sketches when he can. He lives but never forgets the enormity of the evil he witnessed. His hatred for the enemy is expressed at a cool distance, but it’s there and who can blame him? War is hell. After the war he’s left with ailments that keep him from steady work. Government doctors dismiss many of his claims as they do so often now with veterans who give everything even their health to a cause. He doesn’t marry. He writes to the pension office. He writes his memoir. He crosses out his name in the book of the dead or missing and lives out his final years in an old soldiers’ home because he can’t afford to live anywhere else. I hope he had people who appreciated him as he sat on the old home porch in summer. In the winter I hope someone knitted him socks. He deserved at least that. Wow, what a tale. As I was reading your post, I found myself wishing for a happy ending to Private Sneden’s story. I hope, at the very least, someone knitted him those socks. Thank you for sharing his story. You’re welcome. I didn’t realize until Private Sneden was captured how invested I’d become in him just reading his day to day activities. The second half of the book is very intense–pages and pages of awful events and how he got by. I hate being cold for an hour–imagine a year of weather extremes, no food and dying men all around. It breaks my heart. a Beautiful Tale… and i am agree with you… WONDERFUL drawnings! Oh, sounds like a wonderful book! Did you ever read ‘Heart of a Lion’ about Joshua Chamberlain? What a heroic man – and a good one. No, I will have to look into that–did he fight at Gettysburg? Yes, and in other engagements. He is a true hero. You should google him. I greatly admire him – for his conduct during the war and after. Great post. 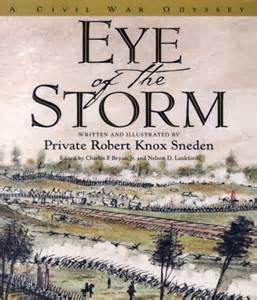 I just bought ‘The Eye of the Storm’ from Amazon and am really looking forward to reading it. I’ve always admired those very few men who, in Kipling’s words, can keep their head when all about are losing theirs. In Sneden’s case it seems like he kept his dignity as well as his head in impossible situations. Your post also reminded me that I still have not read Andersonville by MacKinlay Kantor, which has been on my list for ages. I love your eye for the old, interesting and arcane. Thanks very much. I’m so glad you bought the book. I hope you like it as much as I did. I kept waiting for Sneden to lose it (at least for a short time). Just reading some of the daily entries was disturbing enough! Maybe he did break down occasionally but as you said he chose to keep his dignity when writing it all down. Just received my copy from Amazon. What a beautifully published and amazing book this is. I’m now listening to ‘Andersonville’ while looking at Sneden’s illustrations.